Marcia, my co-teacher for confirmation had a dining room set to give away and offered it to Tim and I. I have been wanting a new table and chairs for a while now since all we had was a small table (even with the leaf in) and 4 chairs. Whenever we had company over we’d either not even sit at the table, or crowd around. Our new table is bigger without leaves than our old one with it’s leaf. And our new table has 2 leaves that go with it! I am super excited about it. 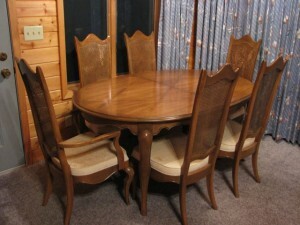 The table is gorgeous, and the chairs will be after some loving. I need to reupholster the seats and paint the mesh backs that have gotten a little discolored. They’re still better than our old ones that were falling apart, and I came across some fabric that I like when shopping for fabric for the glider I reupholstered. So I’ll have some fun shopping for the fabric. I am very excited to see God continue to bless us in ways that we forget about. I started wanting a new table and chairs about a year and a half ago when we had family over for the holidays for the first time. While showing my side of the family around town we went into a thrift store that had a really nice dining room set, but we didn’t have the money for it. A few months later I went back in to see if it was still around, and it wasn’t, so I soon gave up on the idea of getting a new table of chairs. Next Monday will be our first time to use the dining set with company when my Dad and Grandparents come up to visit after my cousin’s wedding. I’m excited that we’ll already get to use it! If you click on the picture you can see the set better. The table has a really pretty diamond pattern in the wood.